During Muslim occupation of Spain, with the evolution of legumes, favas became popular and with this a new image was created in cookery. Other vegetables were introduced too like endives, cultivated carrots that were a little different from wild carrots, turnips, leeks, which were not well received, and many others like gourds, that were adapted for their compatibility with existing dishes and popular legumes like lentils and chickpeas. Curiously, olives were not included in dishes but reserved for making olive oil or they were be placed on the table to nibble at will throughout the meal. By the 16th C Queen Isabel Valois, wife of Philip II of Spain ate them as a dessert. All the dried roots of the vegetables had another mission in culinary life that was to supply the necessary acid thought essential for good health. Market gardens extended into Christian Spain. In the 15th C Miguel Lucas Iranzo was supplied with gourds from areas around Jaen as tiths which laborers farming his lands paid. Market gardening was improved and expanded in 15th C England to include cabbages, carrots and spinach. Boil eggplants until almost soft. Remove from water and put the in ice cold water to stop the cooking process. Peel them and cut them into junks. Squeeze them very hard to get rid of excess water. Fry bacon. Save the fat. 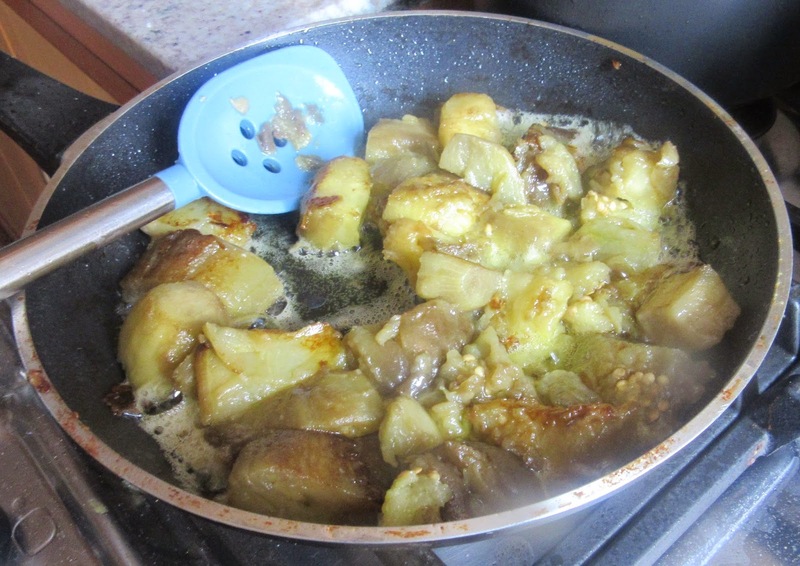 Fry the chunks of eggplant. In the bacon fat. When browned place them in a casserole. Cover them with grated cheese. Crumble the bacon and sprinkle that over the cheese. Beat egg yolks in verguice and pour them over the mixture. Put the casserole under the grill and cook until golden brown (about 15-20 minutes). Mondar las berenjenas y hacerlas cuatro cuartos y mondadadas de la corteza ponlas a cocer y desque sean bien cocidas quitarlas has del fuego y entonces esprimerías ente dos tajaderos de palo, que no les quede agua, y después picarlas con un cuchillo y vayan a la olla y sean muy bien sofreídas con buen tocino o con aceite que sea dulce, porque los moros no comen tocino, y desque sean bien sofreídas ponlas a cocer en una olla y echarle bien caldo grueso y la grasa de la carne y queso rallado que sea fino, y a todos cilantro molido, y después tornearlas con un haravillo como calabazas, y desque sean cerca de cocidos pornás yemas de huevos batidos con agraz, como si fueran calabazas. m the fire, and then squeeze them between two wooden chopping blocks, so they do not retain water. and then chop them with a knife. and let them go to the pot and let them be gently fried, very well, with good bacon or with sweet oil, because the Moors do not eat bacon. 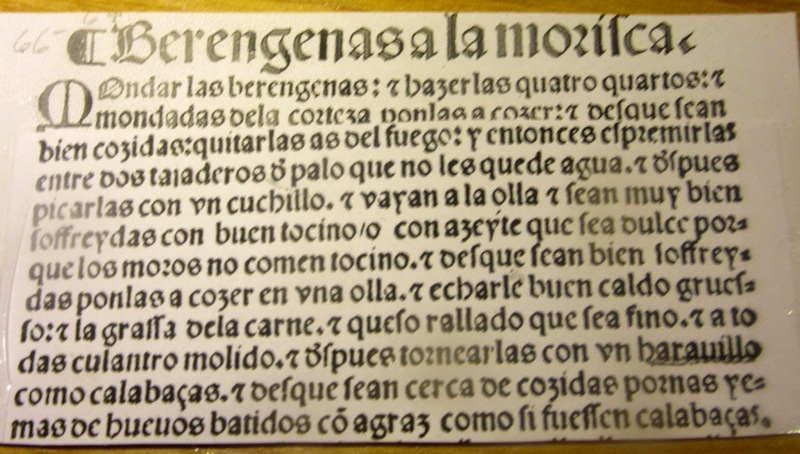 and when they are gently fried, set them to cook in a pot and cast in good fatty broth, and the fat of meat, and grated cheese which is fine, and above all, ground coriander; and then stir it with a haravillo like gourds; and when they are nearly cooked, put in egg yolks beaten with verjuice, as if they were gourds. Take eggplants, neither very big nor very small, but middling, and open them in the middle and cast them to cook with your salt; and when they are well-cooked, drain them with a cloth which is rough; and then chop them a great deal, and cast them in a frying-pan or kettle and cast in a good deal of oil; and take toasted bread and grate it, cast it there within, and cast in aged grated cheese; and when it is stirred for a good while over the fire, have ground dry coriander, caraway, and pepper, and cloves, and a little ginger, and stir it over the fire; and cast in some eggs, and stir it over the fire until it is hard; and then take a casserole, and cast in a little bit of oil, and place it in [the casserole]; and beat some eggs with pepper, and saffron, and cloves, and some of the same toasted bread that is contained in the casserole, and some of the grated cheese; and make it thick and place it on top in the manner of a facing (94) and put your yolks on it; and coagulate it in the oven or with a cuajadera, which is an iron pot-lid with coals on top, and when it is coagulated, remove it from the fire; and cast on top of it a dish of honey which is very good and your duke's powder (95). 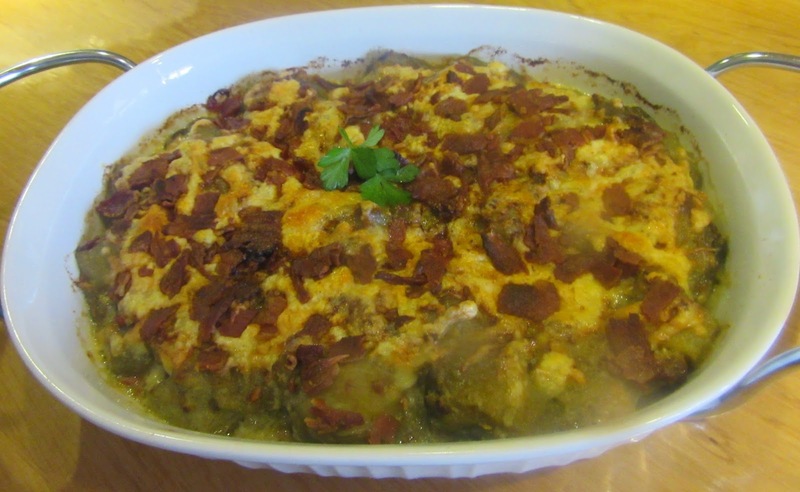 This same casserole can be made from chard or carrots. This is debatable. Perry contends that artichokes did not exist during the Hispano-Muslim occupation, while Huici infers that they Hispano-Muslims developed them from chard. See blog titled alcaravea, published September 12, 2010 for a different version of this recipe.